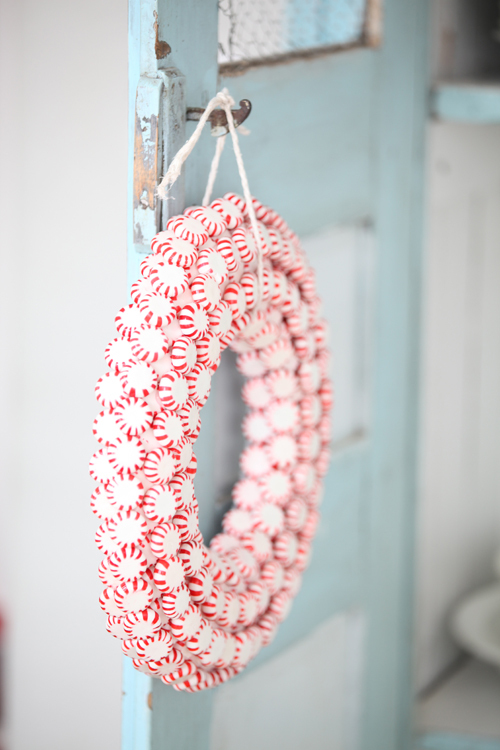 I wanted to share a few images of Nicole's peppermint wreath she finished. The above image is a picture of the wreath from yesterday. 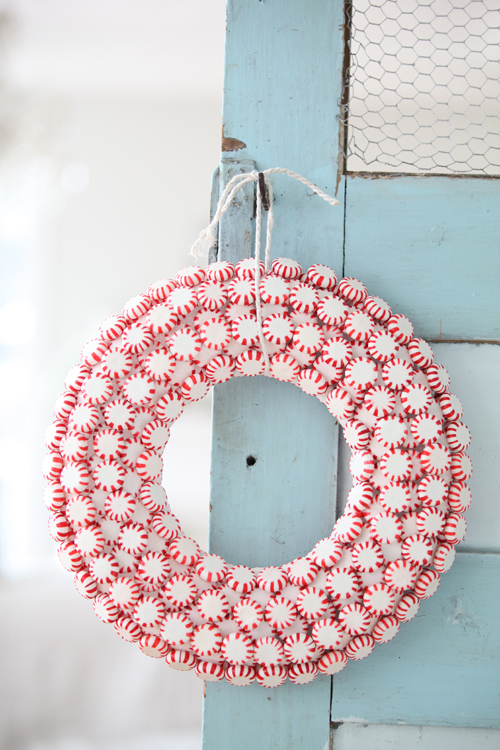 Nicole just glued another layer of peppermint candies to cover the styrofoam wreath form. Nicole chose to use a grain sack tie for the ribbon. Nicole decided she didn't want to use an actual ribbon. I am trying to get that fixed, so hopefully you will start receiving my posts again soon. 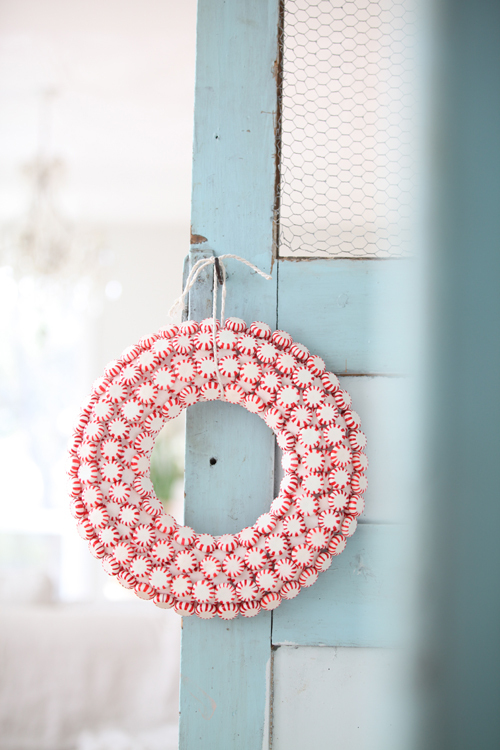 Nicole did a wonderful job on this simple and pretty wreath. She is very neat and tidy with her rows. It looks so fresh and lovely against that blue door. I think the grain sack tie is perfect...it didn;t need a ribbon to fuss it up. 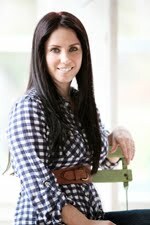 I'm here first time, but i'm loving in this blog ! I love it!!!!! It looks so pretty! Great job and so festive! That is adorable!! And I visit your blog so often! Have a Merry Christmas!! I really love how the wreath turned out!! She did a lovely job! I'm not sure if you got my e-mail, but I just wanted to thank you for the lovely package you sent me of the stockings that I won. I really love them and your special touches!! 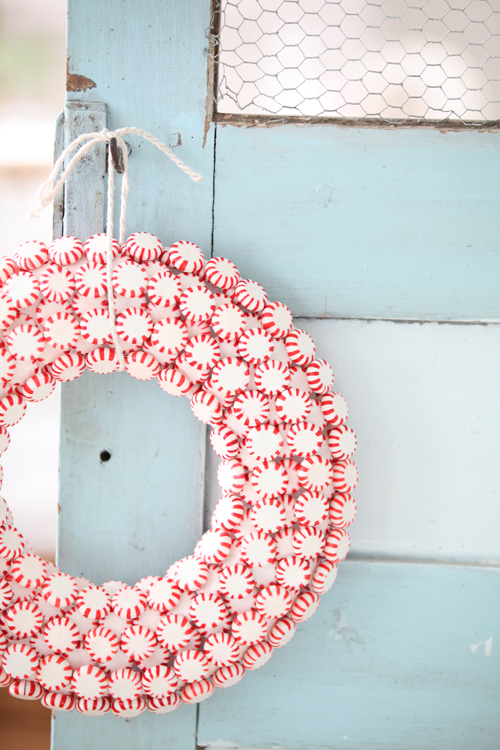 I love the double layer of the peppermints, do you have any idea how those would store? I figure they wouldnt be good the next year at least here in Texas they would probably melt in our attics. oh it looks great! and the images are so soft! very pretty! That is darling! I just love how simple and bright it is. 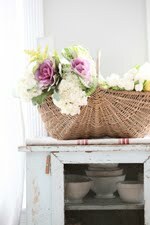 Nicole did a great job, and I love how you photographed it against the turquoise cabinet, gorgeous! 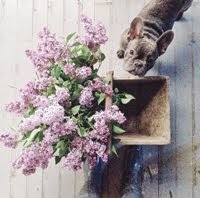 Your photos make me swoon! Adorable, She did a great job. Great job. It's such a happy wreath, you can't help but smile! it is so festive and pretty! Hope you and your family are doing well and I wish you a wonderful Christmas! I love this wreath! Your daughter did a wonderful job. It is so fun and festive. It's amazingly cute, Maria! well done. I'm just now seeing this post about the peppermint wreath. What a wonderful idea, and it's soooo cute! 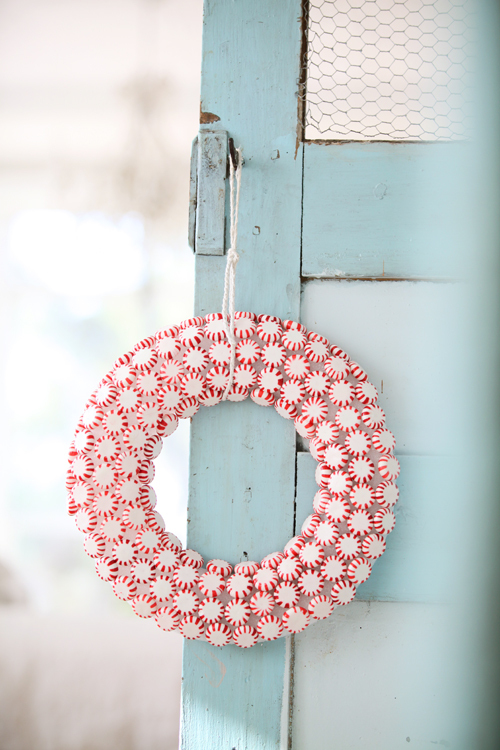 Peppermints just feel so Christmasy to me! I hang them on my tree. This is just so fun and charming!